Chain stay angle generally refers to the angle from the rear axle to the center of the bottom bracket. 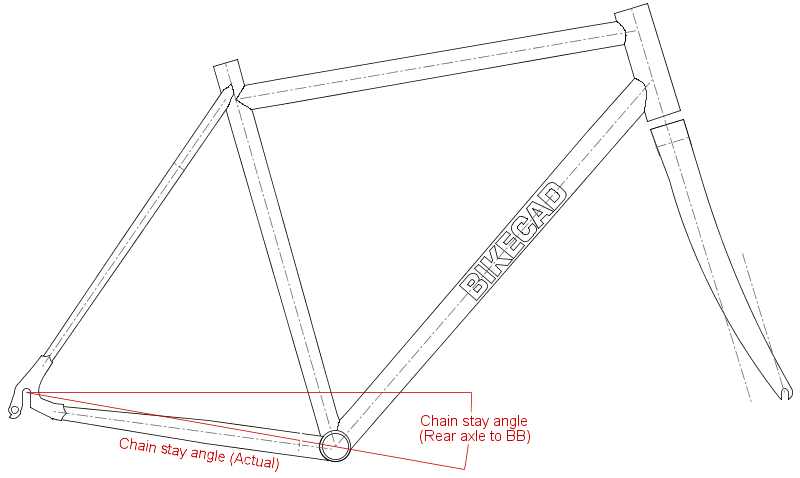 In BikeCAD, this dimension is identified as Chain stay angle (Rear axle to BB). Meanwhile, BikeCAD also presents a second chain stay angle. This one is labeled Chain stay angle (Actual). This measurement refers to the actual angle from the rear end of the chain stay to the front end of the chain stay. In the above diagram, a dropout with an unusually low chain stay attachment point has been used to emphasize the difference between these two measurements. In normal circumstances, the chain stay would be oriented such that the centerline of the chain stay would be more in line with the rear axle and these two dimensions would have very similar values.